As a continuation of this plan, in 2005, Tuba City, AZ, with a population of approx. 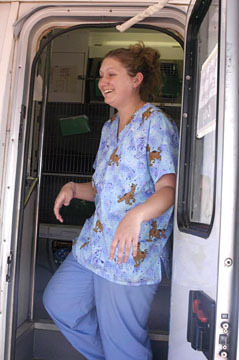 8,000, was chosen for services from two mobile spay/neuter providers for the first week of May, 2005. All services are coordinated through the Navajo Nation Veterinary & Livestock Program, under the direction of Glenda Davis, Program Manager. 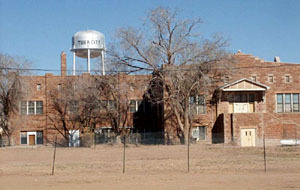 Tuba City is located on the western side of the Navajo Nation in the Western Agency. 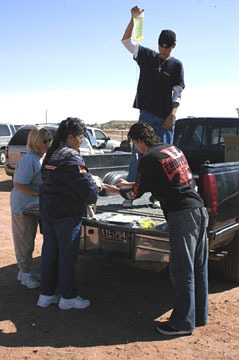 The community of Tuba City is second to Shiprock in terms of population on the Navajo Nation. Tuba City maintains two different time zones for half of the year, with most government services following the Navajo Nation in daylight savings time, while many local businesses keep standard time along with the state of Arizona and the nearby Hopi Reservation. Tuba City is located about 80 miles northeast of Flagstaff, at an elevation of approximately 5,000 feet, on the southern Colorado Plateau. Geological formations, striated rock, and wind greet the visitor. Tuba City is also about 80 miles south of the town of Page, and Lake Powell, 80 miles from the Grand Canyon, and 100 miles from Monument Valley, Utah. Tuba City sits high on a hill, with wide open views. Dinosaur tracks left by several different species lie preserved in sandstone 5.5 miles west of Tuba City off US 160. The presence of Tuba City's past is represented in the many old stone buildings and a historic trading post. During the last week in April, Diane Jarvis, Humane Education Director of Northern Arizona Second Chance Center for Animals from Flagstaff, conducted humane education presentations to 498 kids and 34 adults at Eagle's Nest Elementary School and Tuba City Boarding School. The presentations were mostly to third, fourth, and fifth grades, with one sixth grade class included. The following week, Tova Salabye, Community Outreach Coordinator for SNAP and Navajo Nation Puppy Program Coordinator from the Window Rock office of the Navajo Nation Veterinary Program, gave humane education presentations to pre-K, kindergarten and first-grade classes, meeting with 812 children in all. The presentations included a range of information such as a pledge of kindness to help the animals, information about parasites, how to prevent unwanted puppies and kittens, general care of pets, and bite prevention. 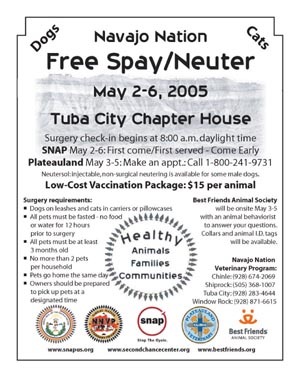 All of the humane education presentations were also timed to help publicize the two mobile spay/neuter clinics coming to Tuba City to provide free spay/neuter services and low-cost vaccinations for dogs and cats. 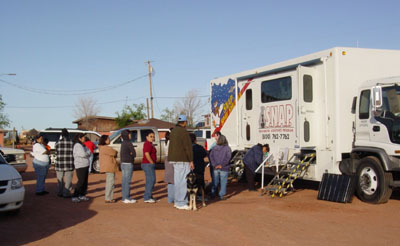 On Monday, May 2, Spay Neuter Assistance Program (SNAP) parked their mobile clinic in the parking lot of the Tuba City Chapter House. Their vet was Holly Ann Johnson, from Taos, NM. 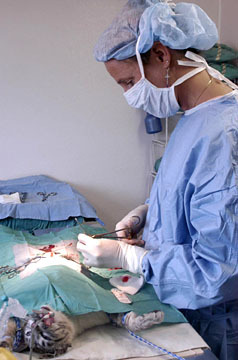 The SNAP clinic can handle about 20 - 25 dog and cat surgeries per day, available on a first come, first served basis. People began lining up for the free spay/neuters early in the morning, and as the week progressed they lined up earlier and earlier each day. Check in at the truck began at 8:00 a.m. SNAP also had Neutersol available, which is a chemical castration for male dogs. Instead of anesthesia and surgery, these male dogs can be neutered with special shots. Recovery time is far less and it's less stressful for the dog. On Tuesday, Plateauland Mobile Veterinary Clinic brought their mobile clinic to the Chapter House parking lot. 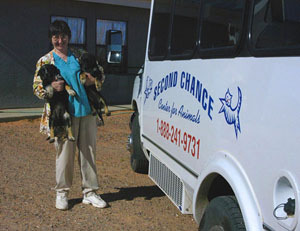 Plateauland Mobile Veterinary Clinic is a program of the Northern Arizona Second Chance Center, which also provided a transport vehicle on Wednesday to help clients without transportation get their animals to the clinic for surgery. 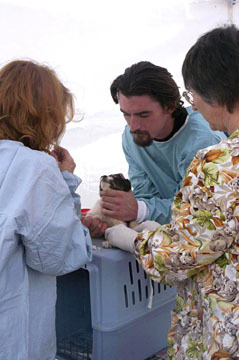 Dr. Carol Holgate is Plateauland's vet, and also maintains her own veterinary practice in Tuba City. Plateauland takes appointments for spay/neuter surgeries, and also accepted walk-up clients. Besides the spay/neuter surgeries, Plateauland had a second crew outside the mobile clinic delivering vaccination packages. The vaccination packages included the 5-in-1 combo vaccine, a rabies shot, and flea-and-tick treatment for dogs. The vaccination package for cats contained a 5-in-1 combo vaccine, a rabies shot, and deworming. The vaccination packages cost $15. per animal. Sherry Woodard, an animal behaviorist from Best Friends Animal Society in Kanab, UT, and Dave Perry, a humane educator from Best Friends, pulled up a colorful van and began dispensing free collars for dogs and cats (donated from Best Friends). Sherry and Dave also brought a portable tag machine and made free pet I.D. tags etched with their owner's contact information. Collars and I.D. tags help assure that if an animal gets loose, those who find it will know it is owned and where it belongs. Sherry and Dave also brought a number of shade tents to help animals waiting for surgery to keep out of the heat of the sun, which was fierce. High winds and blowing red dust add to some of the logistical challenges in dispensing services in a town surrounded by rural areas in the high desert. There was a tremendous response by the Tuba City community. With both clinics filling up every day, 178 free spay/neuters were delivered over the course of the week. 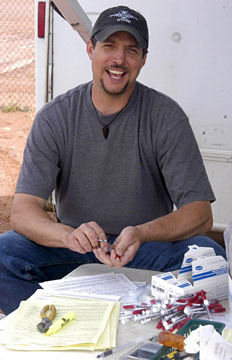 400 vaccinations (rabies and 5-in-1) were given, plus 150 dog and cat dewormers and flea-and-tick preparations. Several hundred collars were given away, and as many pet I.D. tags as possible were made before the tag machine quit. Other services included treatment for parvo, mange, and other health issues. One older dog who is a distemper survivor had some of his teeth removed. While the focus of the clinics is on spay/neuter and vaccinations, the numbers above do not convey the whole story: a kind of combination mash unit and bridge to veterinary care, providing health checks and referrals for future services. The ultimate goal of the combined spay/neuter services and humane education is to boost the health of the animals and the community. Preventing unwanted puppies and kittens from being born is crucial. Stray and abandoned animals run in packs, create health problems, and an increase in dog bites, especially for children and the elderly, and packs often prey on livestock. Vaccinations are crucial to combatting the high incidence of distemper and parvo in dogs and feline leukemia in cats. Also of benefit to the community is that spay/neuter lessens the risks of prostate problems and testicular cancer. Male pets wont fight and roam as much in quest of a mate. Spayed females have reduced risks of malignant mammary cancers and uterine problems. 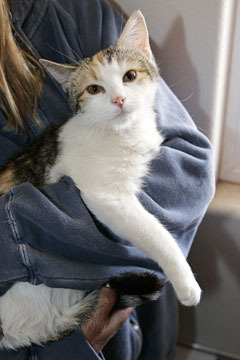 Female cats who are not spayed may go into heat as often as every few weeks; dogs twice a year. Spaying produces a cleaner pet (no bleeding on furniture and carpet during heats) and saves aggravation and work. 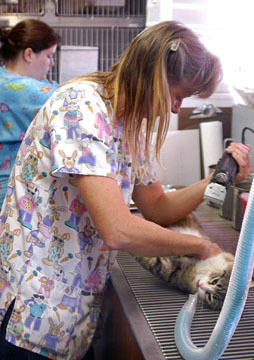 Sterilized animals are calmer, more affectionate and less aggressive. A tremendous amount of suffering can be averted by getting dogs and cats vaccinated in a timely manner, and spayed and neutered. Many people helped extend the services of this partnership. Mary Jo Parys of Tuba City Humane helped with coordination of shuttle services for those in need and volunteered several days at the clinic. Sue Mattson of the Second Chance Center drove the transport vehicle and took lots of photos of the event. 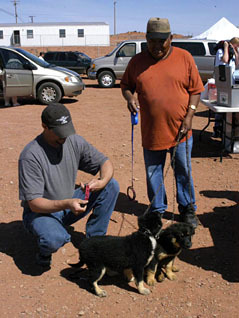 Frank Ramsey of Kayenta Animal Control & Shelter volunteered every day with the clinics. 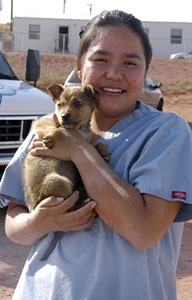 Rose Moonwater of Desert Animal Companions volunteered for several days at the clinic. We wish to thank all of the sponsors and partners in this collaboration who helped to bring services to Tuba City. We wish to thank the Humane Educators who spent days giving presentations to the kids, and asked the kids to share information with their families. May the goal of "Healthy Animals, Healthy Families, Healthy Communities" become a reality for Tuba City as a whole. Thanks especially to the vets, Dr. Holgate and Dr. Johnson, and the vet techs who work grueling schedules and give their all to make the clinics a success. Best Friends Animal Society published a great article about Dr. Carol Holgate. Read it online here. Also a brief article about the Tuba City event. Most of the photos on this page are courtesy of Sue Mattson, Northern Arizona Second Chance Center for Animals.